There are many controls that you can add to the Ribbon and one of them is a Gallery. On this page you can download a few example workbooks that are maybe useful if you want to create your own Gallery. 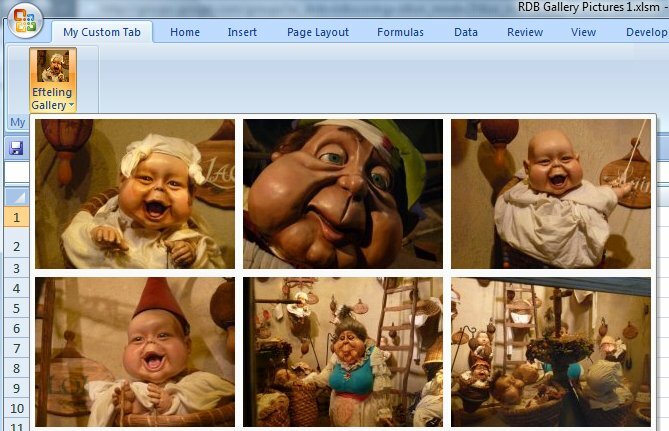 Every example file will use RibbonX to create a custom tab on the Ribbon with a Gallery control. If you click on a picture or Label in the Gallery it will run the macro that belong to this picture or Label, read the comments in the VBA code good. This file load every picture that is in the "Img" folder into the Gallery. The advantage of this is that it is easy to Add/Change/Remove pictures. In the VBA code we can Add/Change/Remove the Screen tips and the macros that you run if you click on a picture. There is no need to edit the RibbonX to do the things above. In this example we can only change the macros in the VBA editor.If you want to Add/Change/Remove pictures and Screen tips you must edit the RibbonX. Note: The pictures are a part of the Excel file. In this example we can change almost everything in the VBA editor.We can Add/Change/Remove Labels and Screen tips in the VBA code and Add/Change/Remove the macros that you run if you click on a label. There is no need to edit the RibbonX to do the things above. 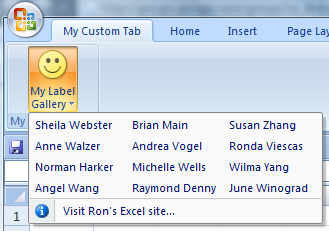 In this example we can only Add/Change/Remove the macros that you run if you click on a label. If you want to Add/Change/Remove Labels and Screen tips you must edit the RibbonX.